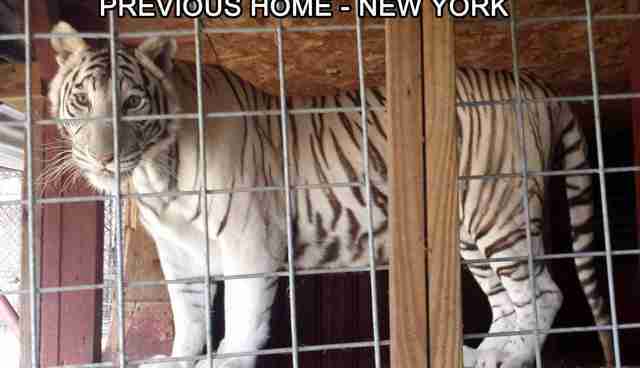 After an owner lost his legal battle to keep custody of his four big cats, they have finally been moved cross country. Three tigers and a leopard have been loaded and moved from New York to their new home at The Wildcat Sanctuary in Minnesota. Once transfer of custody was arranged, the non-profit sanctuary began construction of the initial habitat areas where these cats now live. After spending several months adjusting to their open space, the cats will be released into much larger permanent habitats at the sanctuary. They'll enjoy pools and other amenities, while having room to roam for the first time in their lives. Tammy Thies, The Wildcat Sanctuary's Executive Director, is overseeing the sanctuary's part in the rescue. She explained, "The cats are in great shape and have good temperaments. This isn't often what we see with privately-owned big cats. We can tell the owner cared for his cats and their well-being." In this unusual instance, the owner took good care of his cats, they are happy and healthy, and he had done everything according to the NY state and federal regulations. The legal issues revolved around local zoning changes and instead of being grandfathered in with his cats (as happens in many cases where laws change), he was forced to find them a new home or face jail time. The cats will have a great life at The Wildcat Sanctuary, but moving day was a bittersweet day, with the owner making the best choice for the cats he loved rather than leaving their fate to the state. "They will have new lives when they arrive at the sanctuary, finally having the space they need to roam and live wild at heart." This isn't the first time the cats have been involved in controversy. One of the tigers, 11-year-old white tiger Calcutta, has a well-publicized past. She was obtained from New York's Ashville Game Farm in 2008 after she scratched a 4-year-old child across the forehead at the Saratoga County Fair, requiring 14 stitches. The child had been sitting on a bench posing in front of Calcutta, who was then a full grown 2-year-old tiger. The owner's other two tigers, Caesar and Logan, had also been used as photo props before being sold off by their Michigan exhibitor. For each of these cats, going from approximately 200 sq. foot cages where they are in NY to habitats almost 50 times that size at The Wildcat Sanctuary in Minnesota will be a fresh start in life. The sanctuary hopes, with the help of supporters, to provide these cats with permanent 10,000 sq. foot habitats as the other tigers at the sanctuary enjoy. Tigers in America offers a unique way to help donate towards these habitats. Be sure to visit HERE for more information about helping. Taking in four big cats is a big commitment, both financially and physically. There are many details to a rescue like this. Preparation for the arrival of the big cats has been progressing over the past few months at this state-of-the-art Minnesota sanctuary. 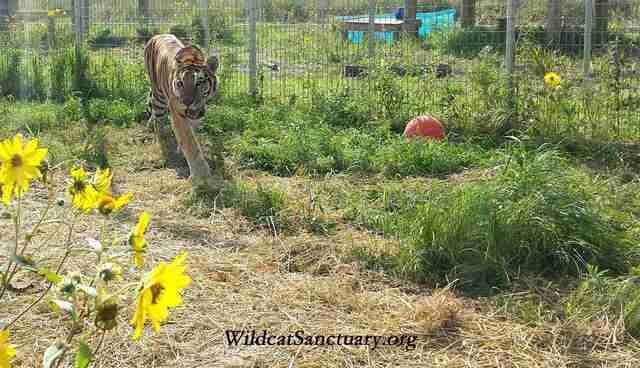 Both Loving Friends Transport and Tigers in America are assisting with transporting the cats comfortably over 1400 miles to The Wildcat Sanctuary. While staff filed paperwork necessary to move the cats, the animals received vaccinations, veterinary exams, and neutering from Dr. John Bergmann, DVM. "Since each cat lives independently, in reality, this is four individual rescues all happening on the same day. It's a huge undertaking!" said Executive Director Thies. The Wildcat Sanctuary has launched an appeal to raise funds for this incredible rescue mission and to help care for the animals for the rest of their lives. To learn more about providing them a lifelong home and to make a donation, please visit HERE or call 320-245-6871. You can become a sponsor parent for these cats, too! Find out how HERE. 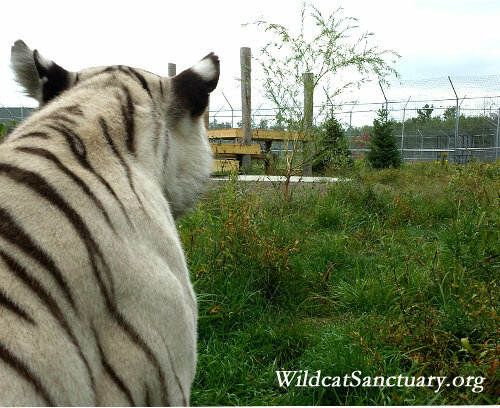 Located in Sandstone Minnesota, The Wildcat Sanctuary is the only accredited sanctuary in the Midwest and is home to over 100 Tigers, Cougars, Leopards and other wild cats living in large free-roaming habitats. TWS provides a natural sanctuary to wild cats in need and inspires change to end the captive wildlife crisis. TWS is funded solely on private donations. The Sanctuary is a rescue organization and not open to the public. Combining natural and spacious habitats with a life free of exhibition, TWS allows all residents to live wild at heart. TWS is committed to public education about the captive wildlife crisis in order to create a world where animal sanctuaries are no longer needed. As a true sanctuary, we do not buy, breed, sell or exhibit animals.